Bake the onion in the olive oil until translucent (4 minutes), then add the red pepper, garlic and ginger. Half a minute after that, add the red curry paste and give it a good stir, warm it up so you can smell it well. Then add the coconutmilk, the bouillon cube and the water. Let it all simmer for a while (10 minutes) before you add the egg noodles and boil them as instructed on the package. 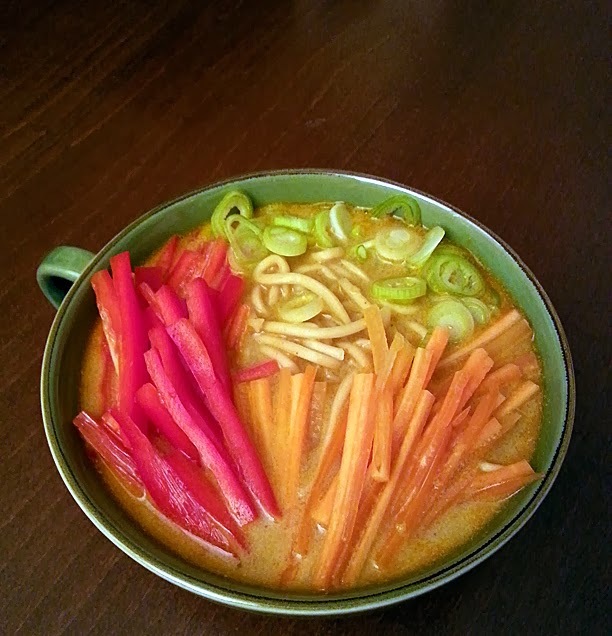 In the mean time, slice the carrot and bell pepper in thin strips and and thinly slice the scallions. I'm looking forward to making this soon! I'm really a fan of how you cut your veggies as well!